In this video tutorial I will cover how to make menus and dialog popups. I’ll specifically cover laying out menus in main.xml, DialogFragment, AlertDialog, Action Bars, Option Menus and more. 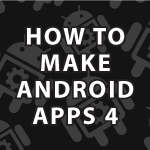 If you missed the first videos they are here How to Make Android apps 1, 2, and 3. Definitely watch them first. All of the code follows the video below. It is heavily commented to help you learn. corner for devices running Android 4.0 and above. // block that you can place into an Activity. you have posted so many android tutorials which are very greatly explained in details. I had seen some of them but as i am fresher i just want to know that is there sequence of those tutorials so that i can start it from the 1st tuts, if it is please tell me how the sequence is..? thank you in advance. hope so you will reply asap. If you don’t think you are 100% ready for Java Android watch my Android for beginners tutorial. It starts simple, but it will get you comfortable with making Java Android apps by the end. I think it is one of the best tutorials I have ever made. If you are 100% with Java and want to learn while making apps watch my Android Development tutorial. if you want the most up to date tutorial and you’re willing to wait while I make it watch my how to make Android apps tutorial. Hi Derek, I love your tutorial. But something happen when I tried to run the app in the kit kat version, the dialog appears without no text, and the buttons “OK” and “Cancel” don´t appear too. Do you know something about it? And what is the way to solve this problem. Thanks. Hi Paula, I’m guessing there must me missing text. I’m running the apps with Kit Kat as well. Try comparing your code to mine using diffnow.com and you’ll find the error. It looks like a strange emulator issue. I’m not sure why that would happen, since I’ve never experienced that. All I can suggest is a re-install. I had the same problem as Paula (it must be a name thing) where the text and buttons wouldn’t show. in MyDialogFragment.java fixes this. This wasn’t shown in the video though. Thanks for your help, Paul. Great tutorials, Derek! I had the same problem, this fixed it perfectly. Is this possibly because the Intended SDK was 21? Android studio does that automatically for me so I’m just guessing. Yes use version 19 for now. Hello Derek ,thank you so much for the tutorials..
You’re very welcome 🙂 I have only dabbled a bit with Lollipop. I’ll have to look into that. Thank you for telling me. I face the same problem of blank dialog, despite all corrections the message in dialog doesn’t show. I tried both on Emulator and Device it doesn’t work. Code is exactly same as on this page. What might be missing, any help. What errors are you seeing in the LogCat panel?